Mr. Ruskin, in his "Notes on some of the Principal Pictures exhibited at the Royal Academy" in 1858, speaks inferentially of this artist as one of the "leaders" of the Pre-Raffaellite school, and reprobates the absence of the rest from the gallery. Mr. Hughes, though certainly less known than some who have attained notoriety in the style of Art which the eloquent author of "Modern Painters" takes under his especial protection, is certainly entitled to assume the rank in which he has been placed. While deprecating the injudicious encomiums which have too often been lavished by writers and amateurs on the pictures of this school, it must fairly be acknowledged that Pre-Raffaellitism has led painters to earnest, serious thought, and to diligent, painstaking execution. "In learning to work carefully from nature, everybody has been obliged to paint what will stay to be painted, and the best of nature will not wait." That this style, in its least extravagant form, should acquire popularity, is not ex- traordinary: the great mass of those who visit our picture galleries can better under- stand what is purely naturalistic in Art than what is purely ideal, especially in landscape painting; they are charmed with a bank of moss, or a bunch of wild flowers, or the texture of a garment which rivals the actual material. "This natural Art speaks to all men; around it daily the circles of sympathy will enlarge;" but the ill-drawn, thin, attenuated figure, having no form of comeliness nor personal beauty, excites only the surprise or ridicule of the many, whatever meaning the artist intends it to convey. Of crow-flowers, nettles, daisies, and long purples." 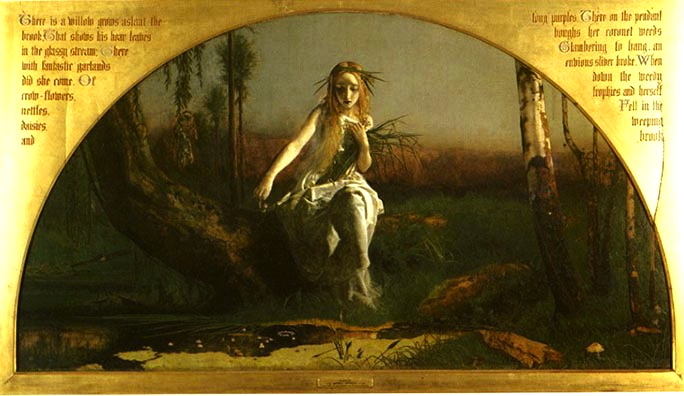 Millais's kind remarks to Hughes about his Ophelia. “Talbot and the Countess of Auvergne.” Art Journal (1865): 332. Hathi Trust Digital Library version of a copy in the University of Michigan Library. Web. 9 August 2013.